Connecting all your social media accounts take just a few seconds. We support: Facebook, Twitter, Instagram, Instagram Business, LinkedIn, YouTube, Pinterest, Google My Business, Google+, Yelp, Blogger ,and more networks to come in the near future. Boost your post to Facebook: The boost feature works with your Facebook ad account. While composing a Facebook message, add the boost option to reach targeted audiences as well as custom audiences (defined in Facebook). You can even schedule your boost to start at a future date and time. Would you like to automatically publish all your new blog posts to your social media accounts? or automatically share with your audiences great new content from the web? eClincher developed just that. Find and share great new content to your social media accounts and pages. 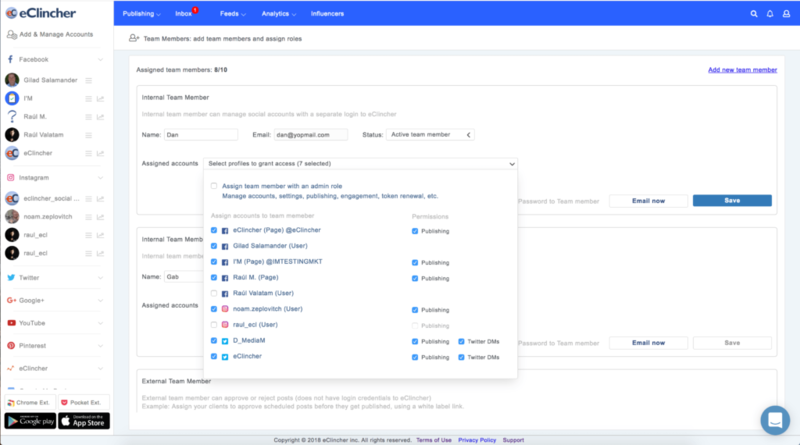 Simply connect any RSS or Atom feed and eClincher will make sure to publish only the newest published content (articles, blogs, and news will not be published more than once). Select how often you want to publish content to your social accounts to drive exposure, engagement and website traffic. 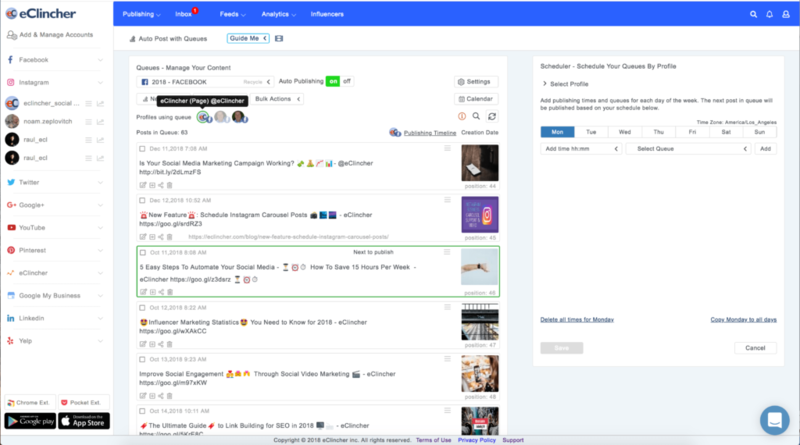 Once you connect your RSS feeds, you will have a constant stream of fresh new content published to all your social accounts. 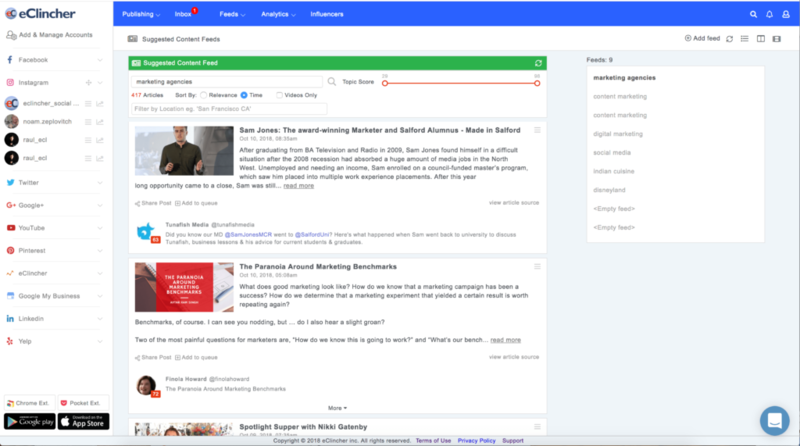 Finding and curating new content is now available with Suggested Content Feeds. In addition to RSS, Atom, Monitoring feeds, Feedly, and Pocket, you can discover new content by using keywords and topics. Simply enter any keyword or search term into your saved content feed and we will display articles and news with scores. 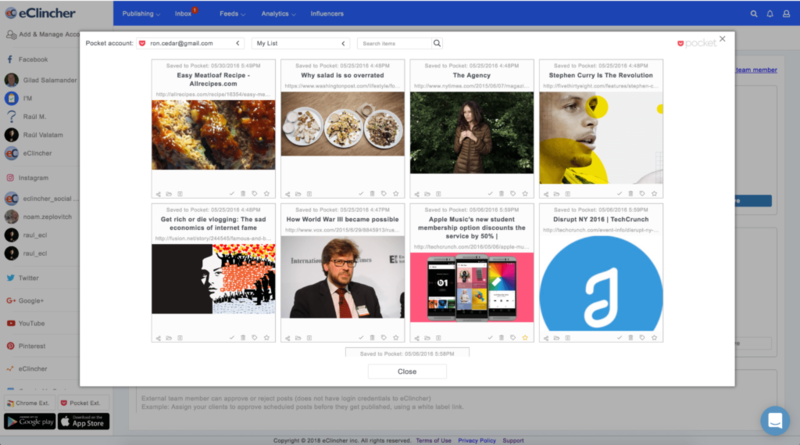 Articles are collected from the web and social media (by popularity). Now, you can easily find content and share it to all your social media accounts. Is your social media team growing? If so, you need a tool that can grow with you. 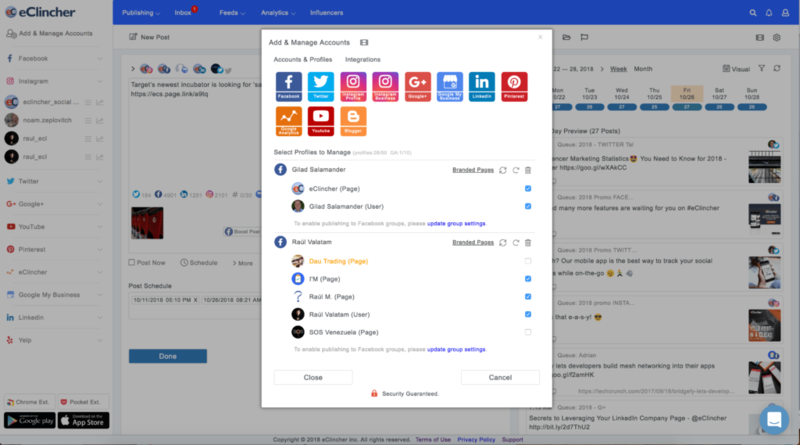 Easily add new team members, as well as assign user roles with permissions to edit or view accounts and brands (clients accounts). Assign inbox item to other team members. Agency or large teams can grow and always add team members. 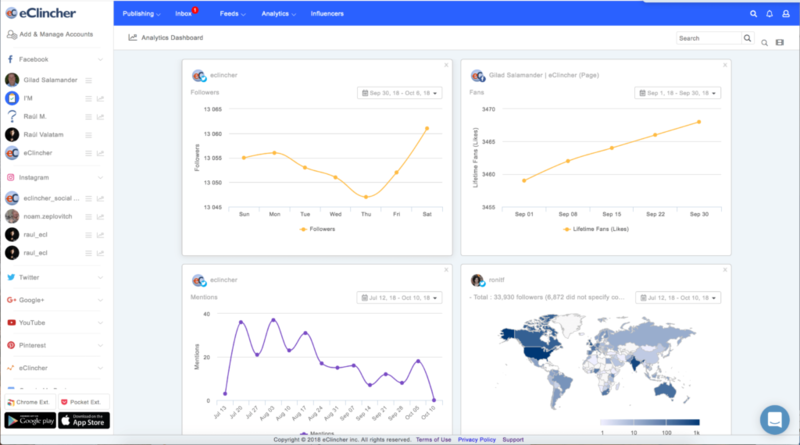 A team member can be internal or external client – your clients will appreciate and love being able to log in and see the progress and activities in their account. Available with Premier, Agency and enterprise plans. 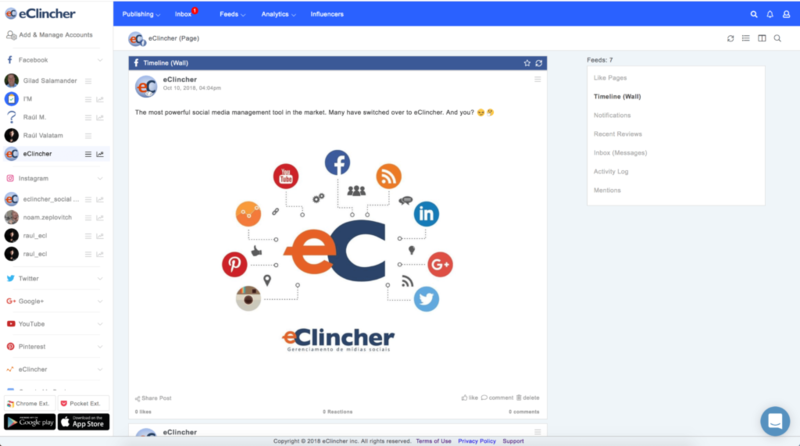 Facebook Branded Pages: When you publish to Facebook page, all the page admins and page managers will see “published by eClincher” at each post header (not to worry – all other public viewers will see “published by page_name”. 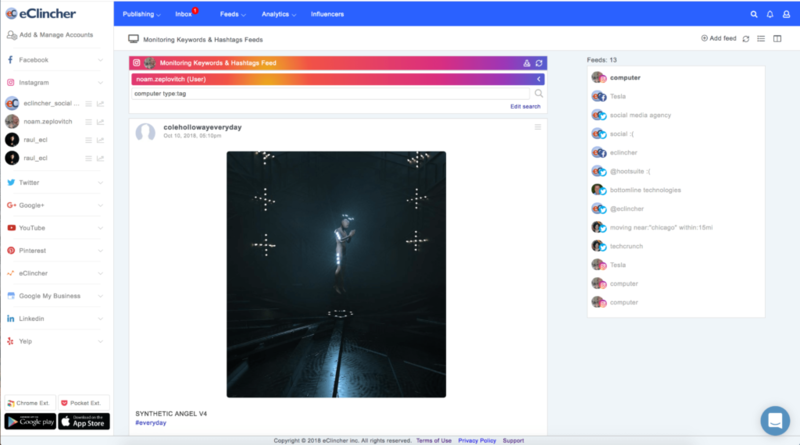 With Facebook Branded Pages feature, all the account admins and managers, including your clients, will see “published by your_brand_or_company_name…” – with every Facebook post you publish. 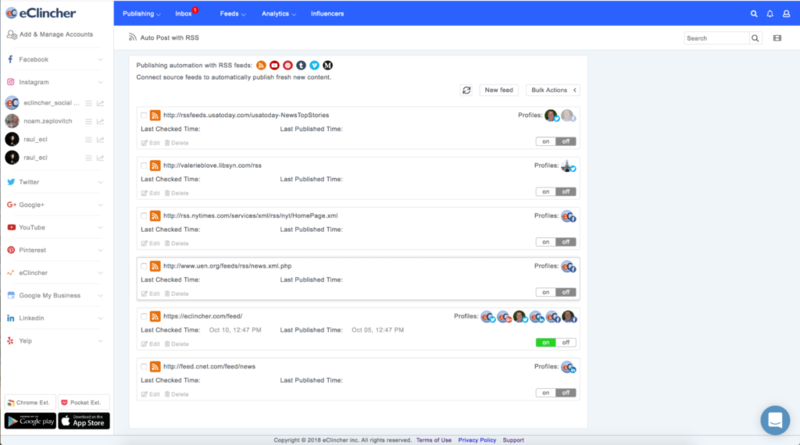 Post Approval workflow: Use our post approval workflow to send posts for approval. 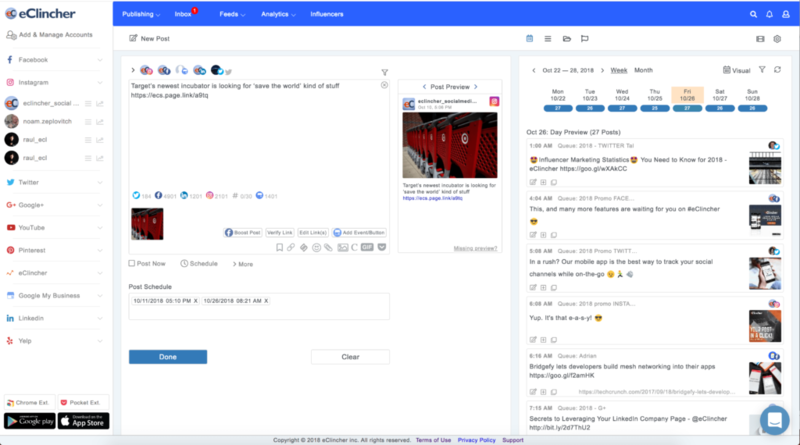 Clients or admins can approve or reject your posts and leave a comment. Post Approval works internally within the eClincher platform or externally with an external URL (complete white label solution). 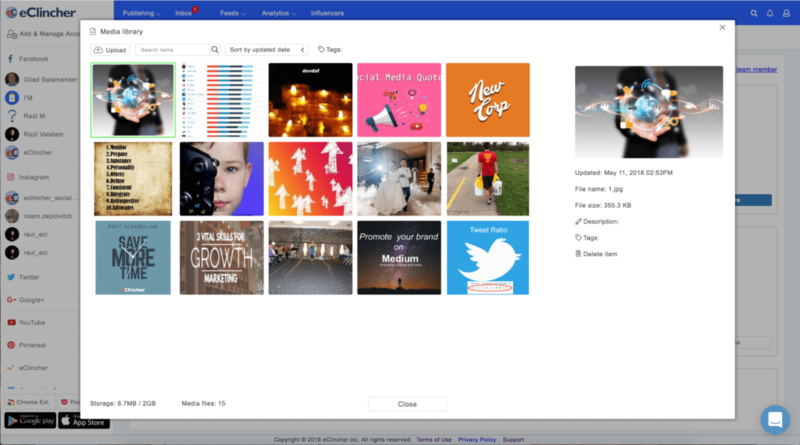 Manage and store your media, creative work and images with your own dedicated cloud storage. Upload images, add description and tag them. 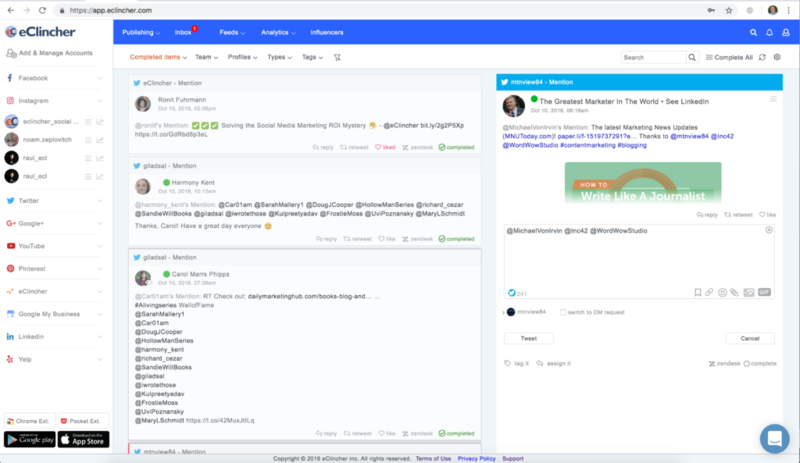 Access your media and share it with your social media posts as well as your inbox responses. Imagine, you are surfing the internet and seeing a great article you want to share with your followers. 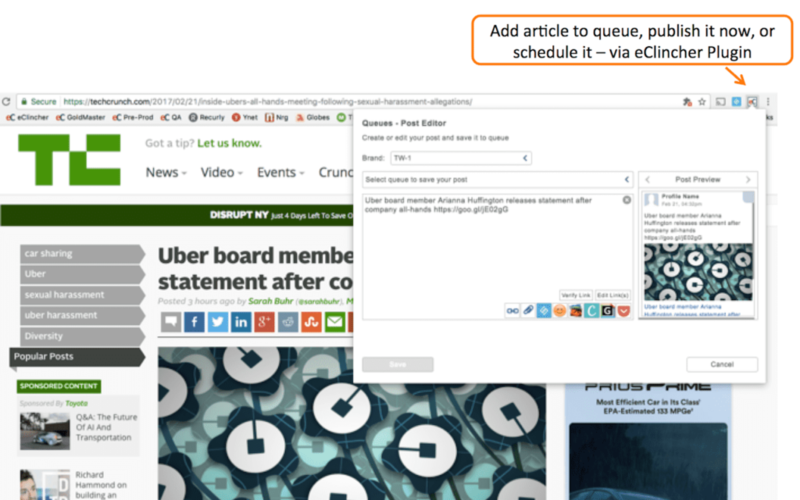 With our Chrome extension plugin, you can quickly share, schedule for later, or add it to one of your auto post queues – all of that, without opening the eClincher app. Simply click on the “eC” button at the top right address bar on your Chrome or Firefox browser. The Chrome extension also includes a “Share” button on the pages you visit. Download the plugin here. Are you ready to get creative? 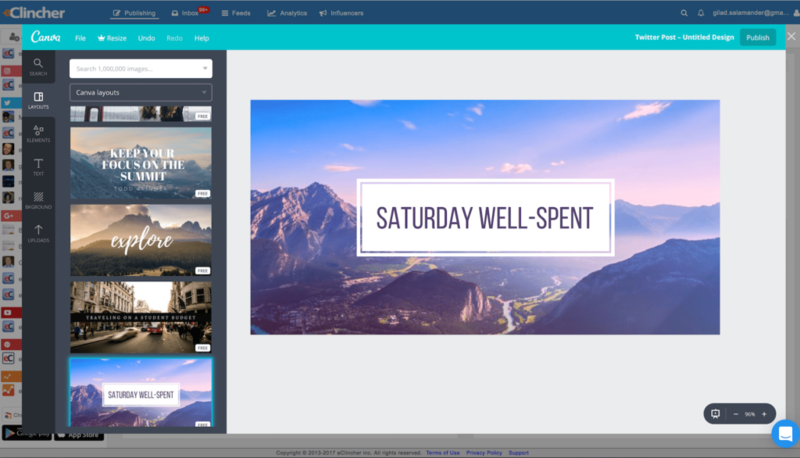 Quickly enhance your social media posts with Canva, Giphy, and emoji, integrations. Design and edit your own images with overlaid text, or select free licensed stock images. Search images and animated GIFs by topic or keywords and increase post engagement. Your social media posts will surely stand out and look professional, and invite clicks. Want to drive more traffic to your site? Are you ready for super engaging and visual call-to-action popup on any webpage content? With our Sniply partnership and integration you can attach a call-to-action to any of your posted links. For example: share a post with your Sniply link to TechCrunch or CNN article. 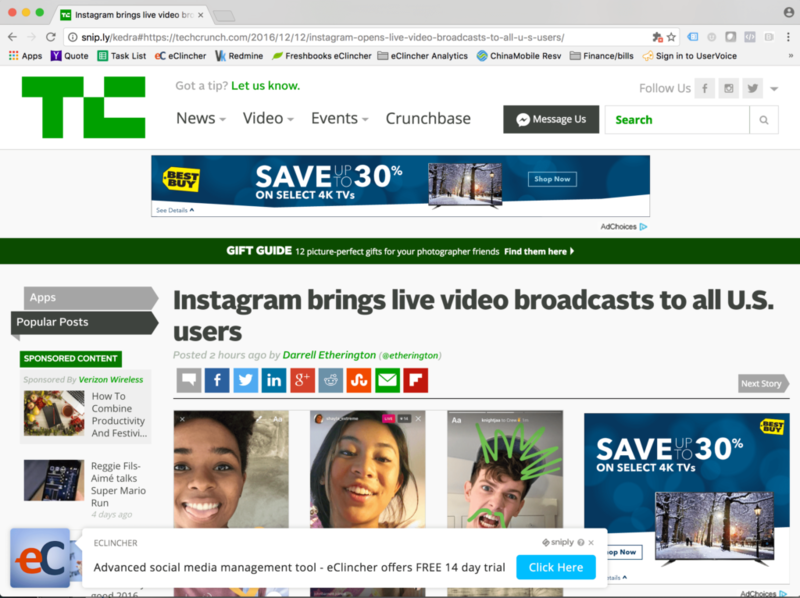 Your audience will see your social media post with your link, click on the link and get to the TechCrunch website – there, they will see a popup with your specific call-to-action!